Venerable Pierre Toussaint (1776-1853). . .
Venerable Pierre Toussaint was born a slave in Haiti and was a philanthropist and founder of many Catholic charitable works. As a slave, Venerable Pierre Toussaint was brought from Haiti to New York and apprenticed under a popular hairstylist in the city. He eventually became the most sought after hairdresser of high society women. Upon the death of his master, he gained his freedom and was very successful as one of the country's first black entrepreneurs. He became quite wealthy, but instead of spending lavishly on himself, he supported the Church and the poor. He and his wife sheltered orphans, refugees and other street people in their home. He founded one of New York's first orphanages and raised money for the city's first cathedral. Even during yellow fever epidemics, Toussaint would risk his life to help others by nursing the sick and praying with the dying. "I have never felt I am a slave to any man or woman but I am a servant of Almighty God who made us all. When one of his children is in need, I am glad to be His slave." Mother Mary Elizabeth Lange (1784-1882). . . Mother Mary Lange was the foundress and first Superior General of the Oblate Sisters of Providence (1829-1832), the first congregation of African American women religious in the history of the Catholic Church. On July 2, 1829, Elizabeth and three other women professed their vows and became the Oblate Sisters of Providence. This congregation would educate and evangelize African Americans. They educated youth and provided a home for orphans. Slaves, who had been freed, were educated and at times admitted into the congregation. They nursed the terminally ill during the cholera epidemic of 1832, sheltered the elderly, and even served as domestics at St. Mary's Seminary. She was born Elizabeth Lange, a native of the Caribbean, believed to be Cuban-born and of Haitian descent. By 1813 Providence directed her to Baltimore, Maryland where a large community of French speaking Catholics from Haiti was established. Mother Mary Lange practiced faith to an extraordinary degree. In fact, it was her deep faith which enabled her to persevere against all odds. In close union with Jesus, she lived through disappointment and opposition until God called her home in 1882 at the St. Frances Convent in Baltimore, Maryland. Venerable Henriette Delille (1813-1862). . .
Henriette Delille was born in New Orleans, Louisiana, where she lived all of her life. She was determined to help those in need for the love of Jesus and for the sake of the Gospel. Henriette was also a person who suffered as she made her way through life, bearing crosses. She taught us that sanctity can be attained in following the path of Jesus. It was in this manner that she dealt with her troubles and major obstacles to achieve her goals. 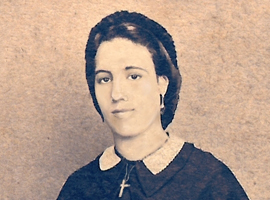 Some of the troubles Henriette met were the resistance of the ruling population to the idea of a black religious congregation, the lack of finances to do the work, the taunts and disbelief of people in her mission, the lack of support from both the Church and civil authority, and poor health. However, Henriette practiced heroic virtue. She had faith, lived in hope, and lived in love. She was compassionate, forgiving, and merciful. She believed in justice and was not afraid to do what was right in the eyes of God. God blessed her efforts. In 1842, she founded the Congregation of the Sisters of the Holy Family. Henriette died November 17, 1862. Her funeral was held at St. Augustine Church. Her obituary states, ". . . Miss Henriette Delille had for long years consecrated herself totally to God without reservation to the instruction of the ignorant and principally to the slave." Fr. Augustus Tolton (1854-1897). . .
Augustus Tolton was the first Roman Catholic priest in the United States publicly known to be black when he was ordained in 1886. A former slave who was baptized and reared Catholic, Tolton studied formally in Rome. He was ordained in Rome on Easter Sunday at the Cathedral Archbasilica of St. John Lateran. Fr. Tolton led the development and construction of St. Monica's Catholic Church as a black "National Parish Church", completed in 1893. Tolton's success at ministering to black Catholics quickly earned him national attention within the Catholic hierarchy. "Good Father Gus", as he was called by many, was known for his eloquent sermons, his beautiful singing voice and his talent for playing the accordion. He is the subject of the 1973 biography, From Slave to Priest, by Sister Caroline Hemesath.